Processing the cranberries with part of the sugar and the orange zest helps to distribute the flavor evenly throughout the dough. Wrap dough in plastic wrap and chill for 3 to 4 hours before rolling. Preheat oven to 350 degrees. Roll dough out on a lightly floured counter to 1/4 inch thickness and cut, then transfer cookies onto cookie sheets that have been lined with parchment paper or silicone liners. Bake 10 to 12 minutes, until lightly colored. Let cookies cool slightly on cookie sheets, then transfer to a wire rack to cool completely. If desired, frost with Orange Icing, below. Melt 6 tablespoons unsalted butter and blend with 2 tablespoons orange juice. Stir into 3 cups confectioners' sugar until completely smooth. 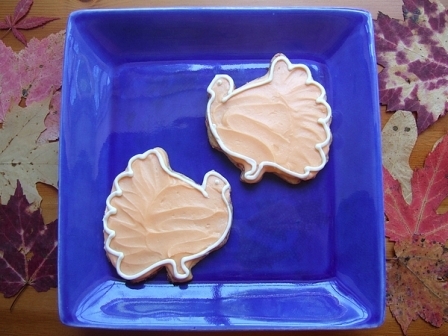 Tint frosting with orange food coloring, if desired, and spread on cookies.